Starting from the left upper corner toward the right the outline of the canvas is marked by throwing a 8-sided die: 1 = 5cm, 2 = 6cm.,3 = 7cm, 4 = 8cm, 5 = 9cm, 6 = 10cm, 7 = 11cm and 8 = 12cm. Horizontally and vertically, these, by chance determined marks, were connected. 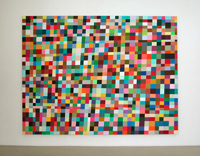 The painting exists of 1178 rectangles = 1178 different colours. Colours were chosen blindfolded from a reserve of approximately 1.200 solid colours from the Pantone Colour Specifier (coated and uncoated mixed).